With the Hugo Nominations being announced tomorrow, the topic of what is right or wrong with the award is quite popular right now. I am going to take a step away from most of the discussion on this topic and say that I do not believe the issue is political. Sure, at the moment, one group is on one side of the political spectrum and the other is on the other, but that is not the issue that is actually before us. Let me tell you a little about my background and why I believe this. When I was young, I worked for my father. My father distributed movies to television. He would find public domain movies with expired copyrights (or no copyright, the laws were different then), find rental companies (reel–this was before tape) that had copies, and make these copies available to television stations to use for mid-afternoon and late night filler. Doesn’t sound like much, but he put two kids through expensive colleges on that work. My job, among other things, was to write catalogues. We did our catalogues along different themes: women’s movies, cowboy movies, scary movies, and—most importantly—Academy Award Winners. Can you imagine even half of those movies getting a nomination today? Do you think Gone With the Wind would still win? Would Mr. Smith Goes to Washington or even The Wizard of Oz still be listed? I am speaking, of course, of Guardians of the Galaxy. Oh, come on! You are thinking, a movie like Guardians of the Galaxy would never win best picture! To which I say: Exactly! What is the point of a Best Picture award that has nothing to do with the best picture of the year? Really, the Oscar award should be called Top Artsy Film. What happened to the award that used to go to movies like It Happened One Night and Gigi? My Fair Lady and The Sound of Music? Can you imagine those movies winning today? Okay, that’s not entirely fair, good movies do occasionally win, but, imho, the best movies of the year haven’t won in years. And it seems to have gotten worse in the last decade. Is it a secret conspiracy? An evil plot? Demons? Possibly demons, but I don’t think so. I think it is a natural process that I will call saturation. The Academy Awards are voted on by…the Academy For Motion Picture Arts and Sciences. These are serious professionals who care about the business. This means they watch LOTS of movies. And, like reviewers, who often pan movies audiences love, they begin to put a higher and higher value on originality. Because they’ve seen it before. They want something new. Also, they like things that are creative because they build on other things, things only they have seen. This movie harkens back in a clever way to one from fifty years ago. That impresses someone who has seen both movies. It doesn’t do jack for the public. So, the insular quality of the voting audience has, over the years, made the Oscars go from topical to trivial. And good movies go by unnoticed and unremarked upon…except in the box office. There were winners people still love today, such as Dune and Lord of Light. And winners that, nowadays, I alone still remember and like, such as And Call Me Conrad (This Immortal). But back then, there was a regular corollary between the books that won and the books that were selling to general fandom. Nowadays, the Hugos seem to have gone the way of the Academy Awards—being awarded by a relatively small group of fans who have read it all. So they look for very different things in a book than the general reading public. (Brief side note: people I have spoken to disagree on the merits of last year’s winner. I have not read it. It could be terrific. But I note that while a few people say they actually liked the book, most seem to like it because it got rid of he and she. In particular, because they thought this was some step kind of forward in women’s rights. But a vote from a small crowd of fans is not the same as a vote from a large one. So lets look at two things in particular: Larry Correia and Redshirts. What’s more, people LOVE his stuff. Teenage girls, school teachers, librarians, technical writers, erudite psychiatrists. What do they all have in common? They are all reading Hard Magic or the Monster Hunter books. The excitement about Correia among fans reminds me of George. R. R. Martin about ten or fifteen years ago, when his third book had come out and not all that many people had heard of him, but if you had, oh my, did you go crazy with book love when you discovered that your neighbor who you ran into at the school bus stop was also a fan of Game of Thrones. Or Butcher. Even today, diverse fans across the spectrum light up at the mention of Harry Dresden. That’s the kind of excitement Correia’s books are garnering. Are his books the best written this year? Maybe, maybe not. But I enjoyed Hard Magic tremendously, and if a book like that won an award, I would not thing the award ill served. Even if there are better books out there, a pertinent, up-to-date award would at least give Correia and Butcher a nod…because the same fans who lay down their dollars so enthusiastically for these gentlemen’s books would tend to suggest them. But before the last two years, these authors were not even getting suggested—because fans in general were no longer voting for the award. Many fans I know don’t even know the Hugos exist. Which is a crime. 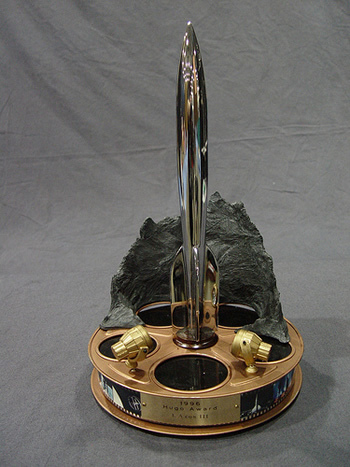 If not for the present and the future, the dignity and name of the Hugos should be more widely known so as to encourage new fans to seek out the excellent winners of yester year. I recently had lunch with a writer friend. While chatting over lunch, she mentioned that when she wants to share SF with someone who has never read it, she always recommends Scalzi, Old Man’s War, in particular. It was a great book, she explained, for introducing those dignified fellows at work to the world of science fiction. And I realized that she was right. The very complaints I had heard about Old Man’s War, that it was derivative of earlier science fiction works, becomes a virtue if you want to introduce someone to the very ideas that those older books represented without overwhelming the person. But my eldest son LOVED it. He’d never read the many things it borrowed from. The story was new to him. So, did Redshirts win its Hugo on its merits? Probably not. Throughout time immemorial, works often win based on how much readers liked the author’s previous works. So, it was partially due to reader’s admiration for Old Man’s War that Redshirts got its nomination…a book, as we have just learned, that is useful for lowering the heavy investment cost sometimes involved with entering our beloved field. Any writer who helps draw in new fans deserves a Hugo nod. Now, you can argue that Redshirts getting an award for nostalgic reasons is a blow against the Hugos because it is like the Academy voting for movies that have in-references to other movies. Or you can argue that it is a win for the Hugos, because the book really did have a broad fan appeal—to the many, many fans who so love Star Trek. I’m not going to take sides on that. For the point of this article, it doesn’t matter. There was a recent much copied quote about the Hugos belonging to a small group of people. Science fiction already has an Academy-like award presented by field professionals. It’s called the Nebulas. The Hugos were supposed to be the popular vote. The question is: How can it become popular again?